Motorists, motorcyclists, and bicyclists alike are tasked with sharing the road safely. While considerable attention and effort are devoted to safety improvements and educational campaigns designed to make this goal a possibility, far less attention and effort are directed to identifying and mitigating the dangers pedestrians face as they make their way along—and across—our nation's busy roadways. The National Highway Traffic Safety Administration (NHTSA) defines a pedestrian as “any person on foot, walking, running, jogging, hiking, sitting, or lying down who is involved in a motor vehicle traffic crash.” According to the NHTSA, more than 4,700 pedestrians were killed—and approximately 66,000 were injured—in traffic accidents in 2013, which breaks down to one auto accident-related pedestrian injury every eight minutes and a fatality every two hours. As grim as the national statistics may be, Delaware has the regrettable distinction of having the highest number of pedestrian fatalities in the nation with approximately 2.7 pedestrian deaths per every 100,000 people. In 2012 and 2013, pedestrians were nearly twice as likely to die in Delaware than in any other state and the situation continues to worsen. In 2014, the state reported 28 pedestrian deaths—matching record highs from 2006 and 2012. In 2015, the number of pedestrian fatalities rose to 36 and now, for every pedestrian killed, another eight are injured. New Castle County had the highest number of accidents involving pedestrians—of the 255 pedestrian accidents reported, 26 resulted in at least one fatality. These statistics raise important questions: Why are our pedestrians at risk and what can be done to keep them safe? Urban setting. In 2014, approximately 76 percent of pedestrian accidents occurred in urban areas, many of them near lower-income housing. Alcohol or drugs. Motorists under the influence of drugs or alcohol have slower reaction times and are less able to spot a pedestrian in the roadway. Alcohol and drug use by pedestrians also play a role in these crashes; of the 36 pedestrians killed in 2015, 27 were under the influence of alcohol or drugs. Time of day. The majority of Delaware pedestrian accidents occur at night when it is more difficult for motorists to see pedestrians walking alongside—or crossing—roadways. Beach traffic. A large number of pedestrian accidents have occurred on Route 1 in Rehoboth and Dewey Beach. Traffic law violations or motorist errors. 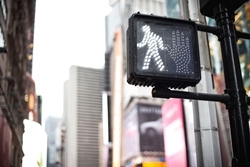 Accidents involving pedestrians may also be caused by speeding, distracted driving, making quick turns through crosswalks, and failure to see pedestrians due to cars parked along the roadway. Were You Injured in an Accident in Delaware? Because they lack the protective outer shell of a vehicle, pedestrians involved in accidents are particularly vulnerable to serious injury and death. If a pedestrian is fortunate enough to survive an accident, they're often left unable to work and facing a long and painful recovery period that brings with it a significant financial burden. If this describes your situation, the skilled legal team with the Morris James Personal Injury Group can help you explore your legal options and fight for compensation for damages, such as medical expenses, lost wages, pain and suffering, and more. Contact us today to arrange a no-cost, no-obligation initial consultation to discuss your case.